Ground floor: Cloakroom. Kitchen (oven, microwave, dishwasher) with door to courtyard. Utility room (washing machine). Dining room (A/C) with doors to terrace. Split level living room (satellite TV, DVD, CD, A/C, WiFi, ganes console) with doors to terrace. Central heating throughout the house.First floor: Principal double suite (Sat TV, A/C) with en suite bathroom, dressing area and private sun terrace.Lower level: Shower room. Twin bedroom (A/C) with terrace. Twin bedroom (A/C) with en suite bathroom and terrace.Suite 1: Double bedroom (A/C) with en suite shower room. Twin bedroom (A/C) with en suite shower room. Central heating.Suite 2: Double bedroom (A/C, fridge) with en suite bathroom (spa bath, separate shower) and private courtyard with shower. Twin bedroom (A/C, fridge) with en suite shower room and private courtyard with shower. Central heating.Outside: Games room (TV, DVD, table football, pool table, card table, Playstation). Table tennis. In-built barbecue. Covered dining terrace. Covered and open terraces. Lawned gardens (illuminated at night). Poolside shower. Private parking (double garage).Private heated swimming pool (12m x 6m) with corner Roman steps.Separate solar heated children&#39;s pool (7m x 3m) with corner Roman steps. This magnificent property combines stunning panoramic views, wonderful facilities and tastefully landscaped gardens, with stylish, beautifully decorated accommodation on a grand scale. Perched on a hilltop, just 14km inland from the coast and 4km from the nearby village of Boliqueime, a breathtaking 180° vista spanning a swathe of rural countryside from the Monchique mountains across to the Atlantic Ocean can be enjoyed from almost all parts of this magnificent house. Indeed, it is difficult to convey the full beauty of this very privileged property and location in the accompanying photographs! Effortlessly managing to combine the feeling of being in a home away from home, with the ambience, situation and style of an aristrocratic manor house, Cahombo offers superb flexibility of accommodation and would be an excellent choice for larger parties, sharing families or groups of friends looking to holiday together while still retaining the option of good privacy and independence. Smaller parties, however, are certainly not neglected, as reduced rates are available for stays incorporating the main house, with or without the suites, yet with full and exclusive access at all times to all facilities. Both house and grounds are grandly proportioned. The main body of the property boasts three bedrooms with a further four bedrooms, arranged in pairs, in two separate annexes attached to the house. Each bedroom has its own bath or shower room, as well as independent air conditioning, and is decorated with taste, panache and great care. The recent refurbishment brings a striking, contemporary look to the interior bedrooms and living areas, where ice white sofas and furniture look cool and modern against the traditional tiled floors. An archway leads into the spacious dining room with a further archway giving access to an L-shaped kitchen that is not only very well equipped, but also manages to effortlessly combine the charm of some traditionally designed features with the convenience of modern facilities, such as the large cooking range with two separate ovens and American-style fridge/freezer with drinks chiller and ice-maker. Outside facilities can only be described as magnificent! At your disposal are a large private pool, separate 7m x 3m solar-heated children&#39;s pool, several huge sun terraces, various covered and open dining terraces, an in-built barbecue, ample lawned gardens and a lovely poolside games room that is sure to inspire impromptu pool, table football or PlayStation tournaments! Further afield, the nearest beaches at Praia de Falésia (15km) and Olhos de Agua (12km) are just a 20 minute drive. Shops and amenities are located in Boliqueime (4km) or Paderne (8km), several local restaurants serving good value menus of the day dot the surrounding area and various country walks can be enjoyed directly from the gates of the house itself. Parties paying the 6 person rate will have access to the main house only.Parties paying the 7-10 person rate will have access to the main house and suite one only.Parties paying the 11-14 person rate will have access to the main house and both suites.Rates for parties of up to 8 persons and parties of up to 12 persons are also available on request.Housekeeping service six days per week (not Sunday).The main pool can be heated (minimum three days notice to be fully effective) at a cost of €285 for 2019, paid directly to the house owner.The main pool can be fenced on request (no extra charge if requested at time of booking).The owners of this property respectfully request that guests do not smoke inside the house. 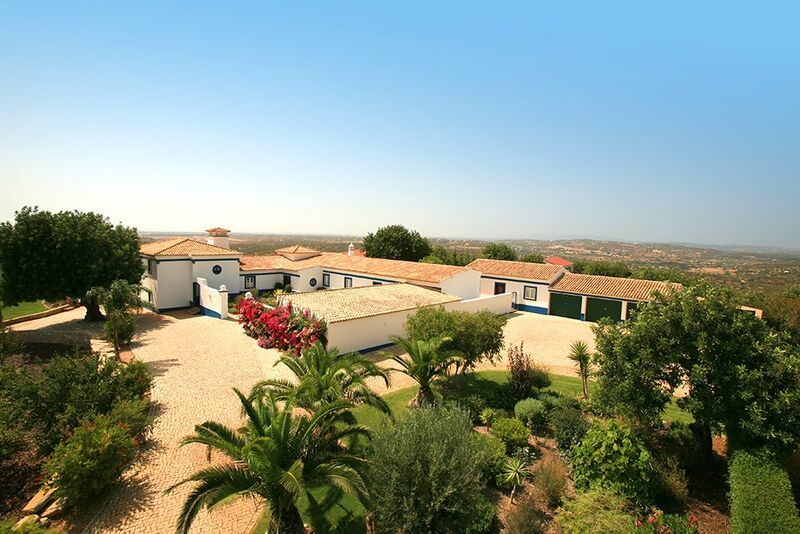 This is a beautiful 7 bedroom property located in Faro, Portugal. This villa, in Malhadais, boasts a gorgeous sea view sleeping 14 people. The villa offers superb accommodation, including modern luxuries such as a DVD player, central heating, table tennis, swimming pool, heated pool, television, open terrace, covered terrace, air conditioning and internet access. You can bask under the Portuguese sun in the villa’s beautiful open terrace and covered terrace, making use of its barbecue.